Contact center supervisors need a broad skillset to make their team successful. 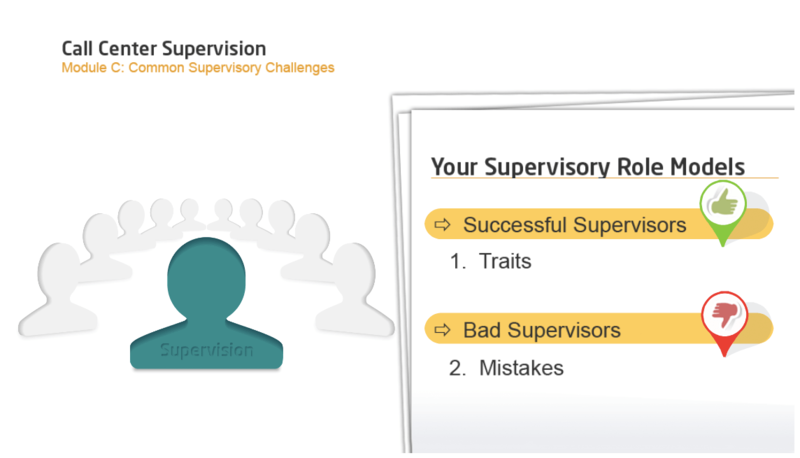 This self-paced e-learning teaches the fundamental skills every supervisor needs. Essential topics like performance measurement, coaching, increasing morale, retaining call center staff, and tracking KPIs are covered. This program is designed to lay the fundamental groundwork for supervision success. Both new and experienced supervisors can benefit greatly from this comprehensive program. Ask any supervisor what their most important task is and the answer will most likely be: coaching. The most successful supervisors place a priority on developing their staff. By effectively coaching agents, supervisors can boost the performance of the contact center. Supervisors can give agents confidence, ensuring they go the extra mile for every single customer. This course focuses on the five steps of a successful performance management program. First, you will learn to define your expectations of the agents. Next, you will learn how to measure their performance against these expectations. Once we know how these agents perform, you can investigate any performance gaps. Finally, you’ll experience how to take action and scrutinize the results. This course equips supervisors with the essential skills required to focus their management efforts where they’ll be most effective. 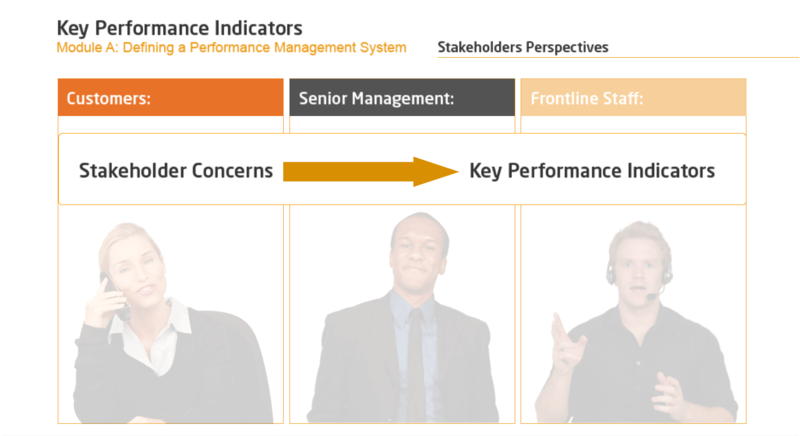 Define measurable agent behaviors and performance standards. Measure agent performance and identify any impeding performance gaps. Provide agents with regular, constructive feedback on their performance. Take action on the outcomes of performance meetings and scrutinize the results. Improve and maintain agent motivation to encourage higher service standards. In this module, we'll test your knowledge of the key learning points from the course. A score of 16 questions, out of a possible 20, is required to pass the assessment. This course outlines best practices for coaching call center employees for improved performance. It describes the benefits of coaching, how to set up a coaching session, communicate effectively, and how to deliver consequences that shape performance effectively. Call center supervisors have multiple opportunities in a variety of settings and situations to coach staff on their performance. This course provides techniques for doing side-by-side coaching for improved performance, including tips on providing both positive and negative feedback. It teaches techniques to use in both counseling and formal review sessions. Finally, this course outlines the step-by-step approach to coach problem employees as well as reward good performers. The course also provides several useful tools to use in planning and conducting a coaching or counseling session. The differences between monitoring/coaching and coaching/counseling. Best practices to use in side-by-side coaching. How to present both positive and negative feedback. How to apply various feedback methods and when to use each. The steps of a positive discipline plan. This course focuses on the best practices of coaching. It teaches the benefits of regularly scheduled coaching sessions, how to effectively communicate to ensure frontline staff understanding and buy-in, and the techniques for reinforcing desirable behaviors so they will be repeated in future customer interactions. 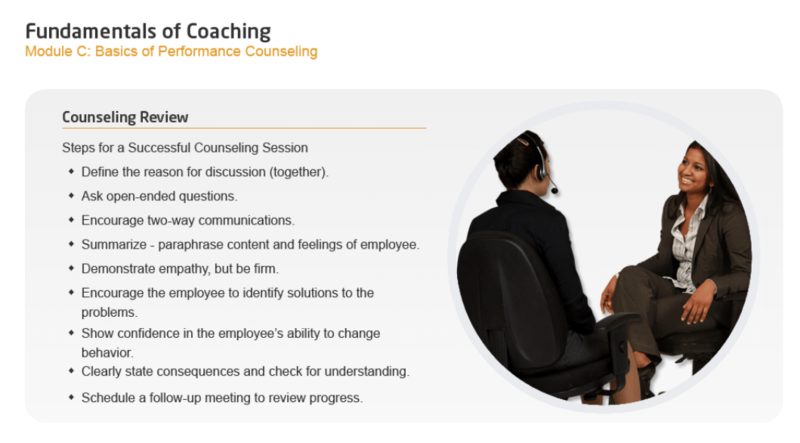 This course also teaches three distinct techniques for call coaching, each approach adapting to the unique needs of each agent according to their level of performance as evaluated in the quality monitoring evaluation. The benefits of effective coaching. The five step coaching process. The types of reinforcement and how best to influence performance. Communication techniques that lead to successful coaching sessions. How to coach to celebrate, clarify and correct agent behaviors. Agent motivation strongly impacts customer satisfaction. 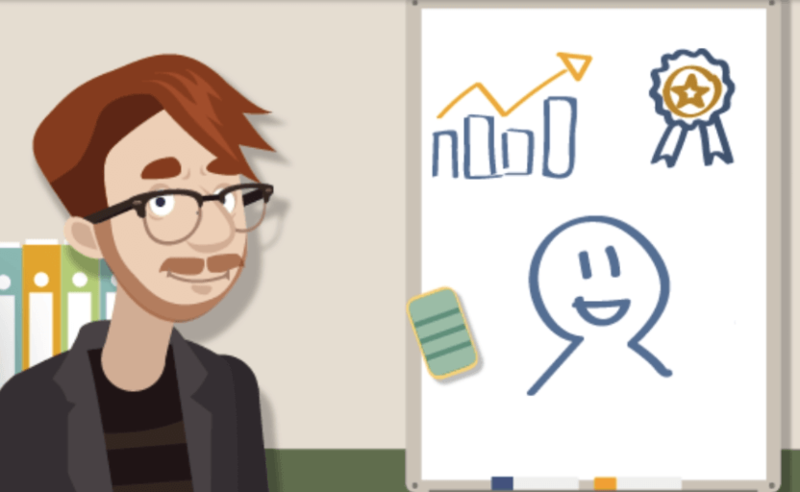 Research tells us if your agents aren’t happy, your customers won’t be happy either. Therefore, it is critical to keep your staff happy and motivated. This course introduces motivational theories and provides practical strategies and techniques to motivate your frontline staff. It outlines different recognition and reward strategies, how to implement a motivational program or contest, and makes your aware of the implications of using individual versus team rewards. In addition, this course is packed with case studies from other contact centers that you can use as a source of inspiration for your next initiative to boost motivation. Strategies for providing guidance and support. The key components of an effective reward and recognition system. The important factors in implementing a new motivational program or contest. The implications of using individual versus team rewards. Dozens of new ideas you can implement in your own center for improved performance and retention. With attrition rates in contact centers being as high as 50%, a contact center’s biggest challenge is finding and keeping good employees. Getting staff turnover under control can very well be the defining factor of the contact center’s success. This course discusses the main reasons employees leave (as well as reasons for why they stay) and which of these are under management’s control. You will learn how to calculate the turnover rate and cost for your center. 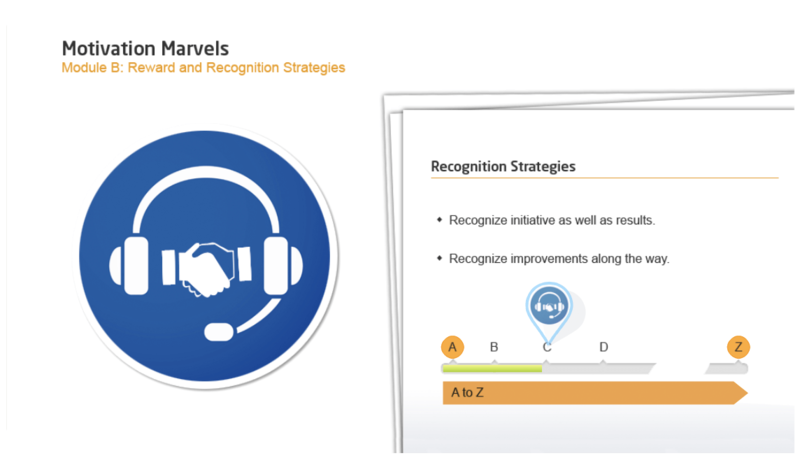 The course continues by outlining strategies to improve the retention of call center staff with fifteen proven techniques and presents the key elements of an effective retention program. How to calculate the hard and soft cost of turnover to the business. The main reasons employees leave and why they stay. Specific actions supervisors can take to improve morale and retention for their teams. The key elements of an effective retention/motivation program. Fifteen different strategies for improving retention. Supervisors have a very broad set of tasks they need to accomplish every week and often have more on their plates than they have time for. Time management, therefore, is an essential skill for supervisors. This course outlines time management principles and applies them to the challenges of supervising in a contact center environment. You will learn how to identify tasks that have most impact on company goals and how to steer clear of time-wasters. We can’t promise you more hours in the day, but this course will help you optimize how you spend your hours most effectively. The importance of time management and what can be gained by managing your day more effectively. 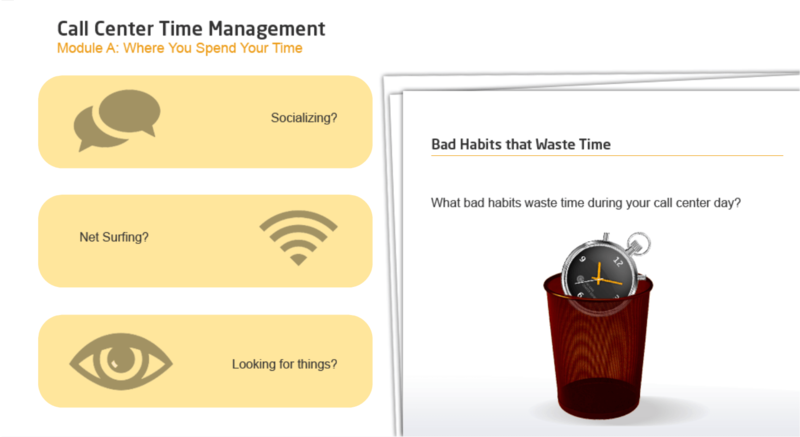 To assess where time is spent and track activities and bad habits that waste time. To eliminate time-wasters and common distractions in the contact center. How to prioritize tasks and increase productivity with goal-directed activities. Time management best practices for email and desktop activities. Contact centers are true data-generating machines. With every customer interaction new data points are created. As opposed to getting overwhelmed by it all, a successful manager or supervisor is able to take advantage of this data and manage by the numbers. This course outlines the steps for defining a performance measurement system, including how to identify the top performance indicators for your contact center. A practical set of formulas and calculations for today’s most common key performance indicators (KPIs) are included. Finally, this course wouldn’t be complete if it didn’t also teach how to translate top metrics into effective call center management reports. To identify the most important KPIs for call center and agent performance. To calculate the service, cost, and productivity implications of staffing decisions. To calculate KPIs that reflect quality of service as well as service efficiency. To avoid the most common mathematical mistakes made in call centers today. How to perform a correlation analysis. Workforce management is the process of getting the “just right” number of staff in place every hour in order to maximize service quality and minimize cost. As a supervisor it is essential that you understand common workforce management practices. This course provides an essential introduction to workforce management for supervisors and managers. It outlines the challenges of workforce planning, the steps of forecasting and scheduling, and the important concept of the “Power of One” in call center staffing. This course creates a common understanding of the importance of workforce management and internal alignment between supervisors and workforce managers. What workforce management is and its implications on cost and service. Why call center staffing is such a unique kind of problem. The step-by-step process of forecasting calls, calculating staffing requirements, and creating workforce schedules. The impact that every single individual has on meeting service goals and balancing workload. Ways to improve attendance and schedule adherence. Being a successful supervisor in a contact center requires a particular set of skills. General leadership and management skills are certainly helpful, but there are also some unique requirements and responsibilities in managing in the call center world. This course outlines the top ten competencies required for call center leaders and supervisors today and teaches how to plan a professional development route to ensure success in this role. This course focuses on the most common supervisory challenges in today’s contact centers and how supervisors can equip themselves with the needed skills and knowledge to improve the effectiveness of team members, increase morale and motivation, and create a team environment that maximizes employee satisfaction, performance, and retention. The most desirable attributes for today’s contact center supervisors. The top ten leadership traits and why they’re important in the contact center. The most critical knowledge and skill areas for supervisors. The most common mistakes supervisors make in managing contact center teams. 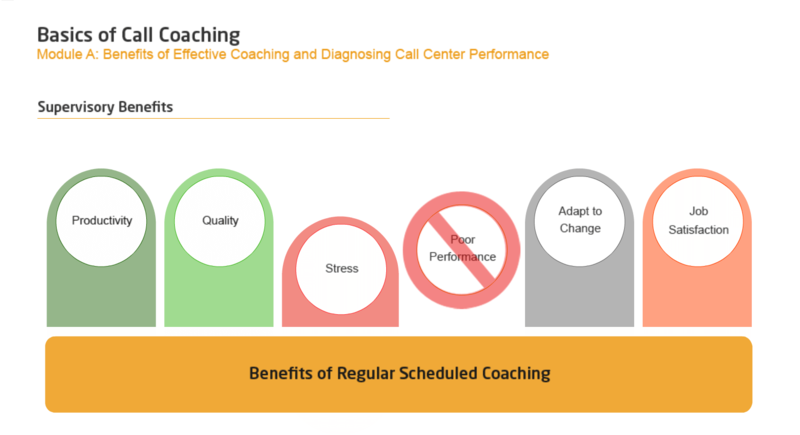 Many call center supervisors are equipped to coach agents on customer service calls, but are missing the skills for coaching and fine-tuning sales behaviors on calls. To maximize sales results, sales training for frontline staff should go hand-in-hand with ongoing sales coaching. This course outlines steps and techniques for supervisors to coach in a telephone sales center. It teaches how to coach to refine call behaviors that make the most of sales opportunities on every call. Motivational factors and factors to get agent buy-in for the sales process. To establish and support a selling mindset for calls. 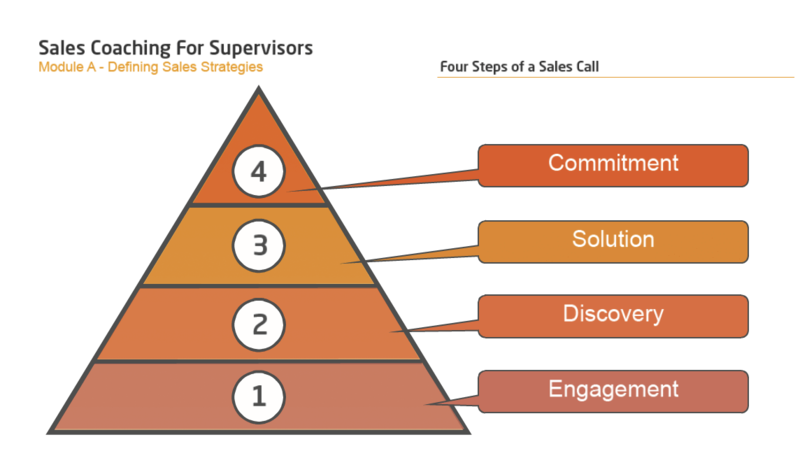 To identify gaps in all four stages of a sales call and how to direct change. Strategies for reinforcing successful sales behaviors. Most contact centers are organized around teams. How these teams perform will have a big impact on the contact center’s overall performance. Supervisors have a decisive role in team performance and need to know how to lead teams to success. This course provides strategies that supervisors and call center managers can apply for creating successful teams. It teaches how to define team structures and processes, organize successful team meetings, improve team communications, and deal with common challenges in the workplace. Team development will be discussed, including how to motivate team members to take on expanded roles and responsibilities. How to write a team charter which clarifies the team’s purpose and objectives. 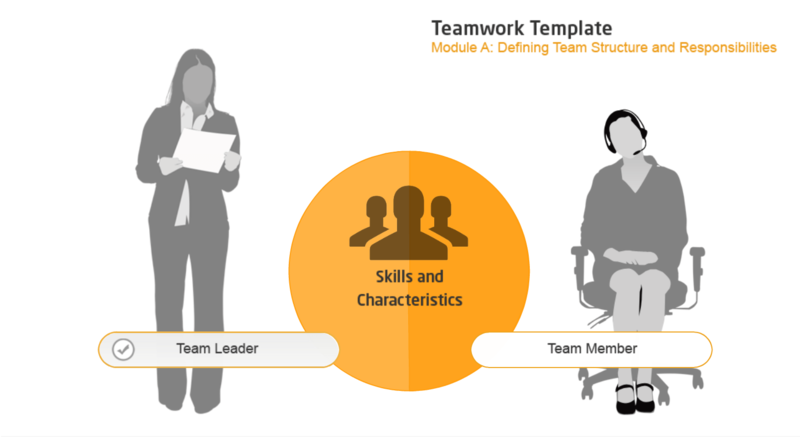 To create a team matrix which outlines member responsibilities and roles. The skills that are needed to be successful as a team member or leader. Ways to motivate individuals and the team as a whole. Effective communication techniques to ensure team cohesiveness and productivity. We offer bulk discounts for orders containing 5 or more seats for a program or bundle. Check our pricing options for Supervision below. If you apply for bulk pricing, please contact us to place your order. Get new hires up to speed quickly by teaching them the basics and terminology of contact center operations. Learn how to measure and calibrate quality metrics and coach towards improvement in order to ensure a consistent service quality. The Supervision program is designed by call center experts to provide a practical and engaging learning experience. Start today.